Nothing says deep summer like the juicy, bright pink flesh of a watermelon. I'm not talking about the seedless model engineered to be eaten politely at the dining table with a knife and fork. No, sir, I mean the kind you have to slice outdoors to keep the sticky juice from covering the kitchen floor. The kind you have to lean over to bite into, and after you chew, you enjoy the secondary sport of seed spitting. So about a week ago, in the midst of the torturous humid heat we've all been suffering, I saw a nice, small watermelon at the market. Licking my lips, I thought I could share part with the chickens and enjoy a good, thick slice myself. Everyone would be happy! I got home and took the melon into the kitchen, sliced out a big wedge over the sink and left it on the counter to take the rest to the chickens. In the barn I got to do one of the most fun food-related things that people almost never enjoy -- I intentionally dropped the melon on the floor to crack it open for the hens. They were all over that sweet pinkness in a matter of seconds, grabbing tasty chunks, then running away from the other hens, all the while clucking away over their prizes. I returned to the kitchen ready for my refreshing slice. Instead, I discovered two naughty cats chomping away at my wedge. Nothing dainty or polite about it -- if I'd gotten them to look up (which I did not), both of their faces would have been covered in pink flesh. So I gave in. I moved what remained of my wedge onto a plate on the dining table and let the cats have at it. They were so excited to be given such a prize, I just couldn't deny them. Then what did I hear? Whimpering by my side? Ulani was not going to be left out! I got a knife and gave her a large slice, too. So this is who had watermelon: Spot, the other rooster, Eartha, Smokey, Lacey, Blondy, Peep, Maria, the other hens, The Duck, Abe, Luke and Ulani. And this is who did NOT have watermelon: me. Ha! What we won't do for our feathered and furred friends. Maybe next time you'll get a wee bit. If you lived close by I would give you a new fresh watermelon. We have been selling them like crazy. If you believe it, the chickens are actually getting tired of watermelon. That is soooo very familiar. We got lucky and the hubby bought one from a guy selling at a service station and it was excellent. Usually it's just like you described. Too funny, Johanna. Thanks for the morning chuckle! CATS like watermelon??? Did not know that! 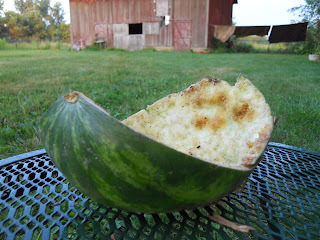 I know my yellow lab likes watermelon cause she stole the chunk I was planning on bringing out to the chickens and gobbled up the whole thing!